St James' Park, in Central London, is the oldest of the Royal Parks in London. 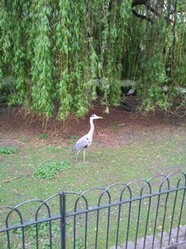 It's a lovely park, with a lake that is home to a vast array of bird life - herons, pelicans, geese, ducks, to name a few. The park went through a variety of changes in fortune over the years, depending on who was ruling the country at the time. Finally, in the 1820s, John Nash redesigned the park to give us what we see today, a beautiful haven in the middle of Westminster. There are 8 Royal Parks in London, one of the prettiest, in my opinion, is St James’ Park. It is in situated between government buildings such as the Ministry of Justice, Wellington Barracks, and, of course, Buckingham Palace, St James’ Palace and Clarence House. The Palace of Westminster, more commonly known as the Houses of Parliament, is close by. St James’ Park features a lake that is home to a vast array of bird life - herons, pelicans, Canada geese, mallards, Greylag geese, to name a few. The pelicans originally came to the park in 1664, as a gift to the king from the Russian Ambassador. Then there are the squirrels. Grey squirrels of course. The oldest of the Royal Parks in London, around 90 acres in size, St James’ Park didn’t have a particularly auspicious start. Like most of the surrounding area, it was originally marshland. Back in the thirteenth century, a hospital was built on what is now the northern side of the park. A hospital for female lepers to be precise, known as St James’ Hospital. Henry VIII, who was king of England from 1509-1547, claimed the land in1532 and had it drained so it could be used as a park where various activities such as jousting and bowls took place. Deer were also reared here, and when old enough, they were taken to Hyde Park to satisfy Henry’s passion for hunting - St James’ Park is not really big enough for that. Henry also built St James’ Palace on the site of the old hospital. The park stayed much the same until James I became king. He arranged for the drainage in the park to be further improved, and had ornamental gardens created. He kept a number of animals there, and an aviary, hence the name Birdcage Walk, the road which now runs along the south side of the park. No doubt there were cockerels in the aviary as well, giving rise to the name of the nearby Cockpit steps. When Cromwell took over as Lord Protector, the park, like so many other things in England, fell into a decline. Cromwell was not what you might call a Jolly Fellow and anything deemed fun was frowned upon. When Charles II, who was born in St James Palace, came to the throne, he borrowed ideas that he’d picked up from his exile in France and had orchards planted and the lake built (which was known as the canal in those days). 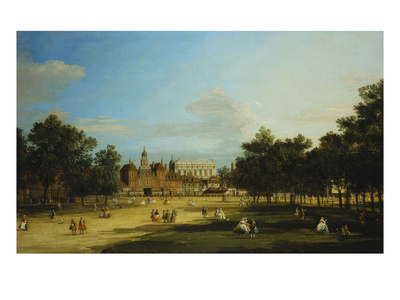 Charles opened the park to the public, and could often be seen there feeding the ducks and walking his dogs. In the 1820’s, gas lighting was introduced in the park, and the lake was cleaned up and redesigned - Horse Guards parade was created by filling in the eastern part of it. John Nash was hired to redesign the park; the lake we see today is his work, with its ornamental gardens and green spaces. Between 1837 and 1840, a house was built for the bird keeper at the east side of the park. The cottage, known as Duck Island Cottage, is still standing. Brings some lovely memories of walking through the park on my way to work in Charring Cross much nicer than walking aling the roads. Thanks for the details it was well written. Thank you Mira. Funnily enough, I've just been having a lesson about this at work! I have some really lovely photographs, and I shall have a go when I get home. Fingers crossed. You should be able to make them smaller with GIMP. It's a free image editing software. Paul has posted a tutorial here on Wizzley. OR they may actually work, no matter what size they are. Note that when you use the image module you can choose full length or half length. I don't think Wizzley minds if the images are rather large. The software should be able to work with them. Thank you! I am still getting used to this site and (obviously erroneously) thought there was a limit on photos. Some of the ones I've got are too big, but will get my trusty camera out and see what I can do. I enjoyed your article, Susan, but would have loved to see some more photos of St. James Park.